Zillya! Internet Security - Complete protection against viruses and hackers. Zillya! 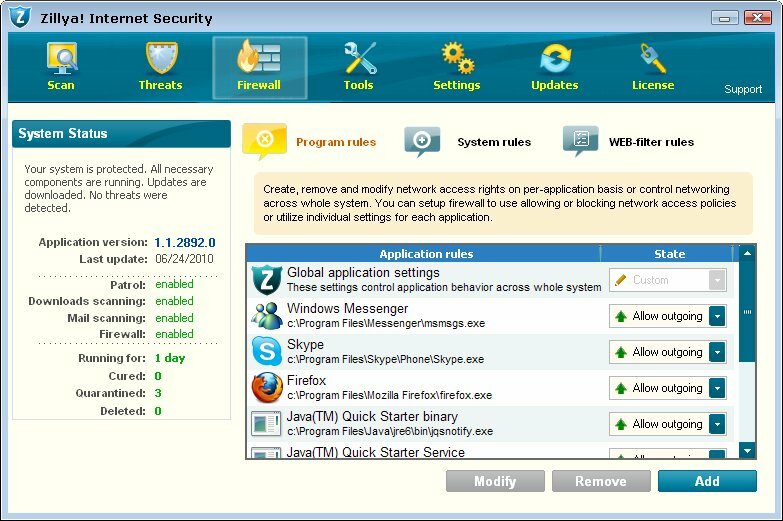 Internet Security has a very simple and user-friendly interface that is easy for beginners. Zillya! Internet Security has all antivirus functionality: - Real-time file checking that detects and prevents viruses and other malware - Mail filter checks all incoming and outgoing mail messages for malware enabling safe and secure e-mail communication - Heuristic analysis allows detection of new and unknown malware - There are three types of scanning - quick scan that checks only critical areas on the computer, full scan that checks all files on the computer and custom scan which allows user to select files and folders to be scanned - Daily updates of antivirus bases guarantee maximum safety Zillya! Internet Security have included Application-level firewall: - Control of application network access. - Protection against external attacks. - Automatic mode that does not require deep understanding of applications network functionality. - Interactive mode for experienced users. - Built-in set of rules. - System-wide application rules. WEB-filtering (scanning of HTTP traffic) - Blocking of dangerous sites. Zillya! Internet Security might block user from accessing certain sites that are known to be malicious. - Blocking of potentially dangerous content from suspicious sites. Some sites are added to database of Zillya! Internet Security as untrusted, these are the ones that might have malicious content. If site is listed this way user might browse it, but any attempts to download executable, archive or other types of files would be blocked. - Creation of own list of sites that will be blocked. Zillya! Internet Security provides free customer support.